Welcome to the Rehoboth Beach and Dewey Beach Resort Area! It is our sincere desire that you enjoy a very pleasant vacation. We ask you to familiarize yourself with our rules and regulations and solicit your cooperation in obeying. Visitors have options for paying for parking in Downtown Rehoboth Beach! ParkMobile - Pay by phone parking! REGISTER NOW - It's Free! View the Parkmobile flyer by clicking here! Parking Passes - daily, weekly, weekend and seasonal passes available at the Parking Department. Located at 30 1/2 Lake Avenue, Rehoboth Beach. Behind the Convention Center. 302-227-6184. The Rehoboth Beach - Dewey Beach Chamber of Commerce & Visitors Center sells daily, weekly and weekend parking passes and is located at 501 Rehoboth Avenue, Rehoboth Beach; beside the Rehoboth Beach Museum in Grove Park. 302-227-6446. Quarters - quarters are available at several change machines located throughout downtown. Quarters are also available at the Visitors Center (location noted above). Click here to view a map of Downtown Rehoboth Beach; the red lines denote metered parking. 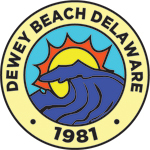 For Dewey Beach parking and rules, visit www.townofdeweybeach.com. Visitors have options for paying for parking in Dewey Beach! NEW! As of 2015, ParkMobile now accepted in Dewey Beach! - Pay by phone parking! REGISTER NOW - It's Free! View the Parkmobile flyer by clicking here! Parking Passes - parking passes available at Dewey Beach Town Hall. Located at 105 Rodney Avenue, Dewey Beach. 302-227-6363. Meters can be fed with quarters. Click here for Dewey Beach Summer Movies, Bonfires, Recreational Activities and Events!